Here are the best memory cards for Nikon D850 DSLR camera, including XQD Memory Cards and UHS-II SD Memory Cards. The D850 is an amazing camera, with 7fps burst, 45MP sensor, 4K videos and 8K time-lapse feature. It has 2 memory card slots, 1 for XQD and 1 for SD and a big buffer. But then again we’re talking about a sensor with 45MP and those are some big processes inside the camera. So in order to take full advantage of the features the D850 offers and if you are capturing 4K video, you’ll need a really fast memory card. If you are a new owner or want to buy an high-end DSLR camera, in this post we have covered the best memory cards for Nikon D850 DSLR. 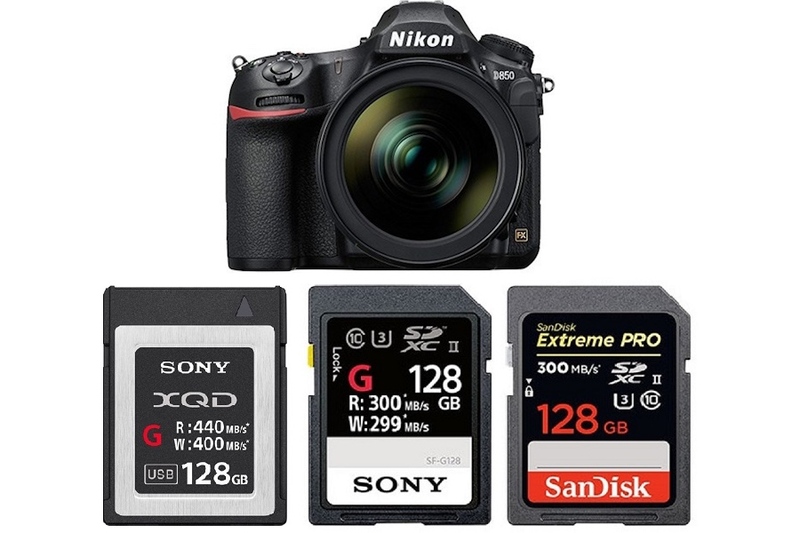 Here are the top recommended XQD & UHS-II SD memory cards for Nikon D850 DSLR camera. Below are the recommended XQD cards & UHS-II SD Cards for Nikon D850 DSLR camera, just choose the one you need! The XQD cards are much faster than SD cards. Currently, Lexar and Sony all offers XQD cards for Nikon D850 DSLR. Still the Lexar 2933x XQD 2.0 is the best selling XQD card for Nikon D500. The Nikon D850 Card Slot 2 is compatible with UHS-II memory cards. The Sony SF-G UHS-II Cards are currently the world’s fastest SD memory cards boasting an ultra-fast maximum read speeds of up to 300 MB/s and maximum write speeds of up to 299 MB/s and it is well-suited for video capture, including 4K, 3D, HFR, and Full HD video. Read more: Best Lenses for Nikon D850 and Nikon Rumors.